Some brokers and carriers are selling health insurance a little differently going the brick-and-mortar route. Mike Augustine, of Greenville, S.C., recently had some errands to run at his local shopping centers: buy some groceries, pop into a mobile phone retailer, pick up some dry cleaning. And lastly, he had to stop by the health insurance store to shop for a better plan. The new BlueCross BlueShield brick-and-mortar retail store at the Magnolia Park strip mall staffs five licensed agents, prepared to help customers — by appointment or walk-in — navigate the new rules of health care reform, and to buy plans as they would electronics or office supplies. Though Augustine has not changed his plan, he says the visit was helpful. “It was a good opportunity to speak with someone face-to-face, not sitting on hold on the phone or looking online through a million plans that make little sense to me,” he says. In shopping centers and on busy main streets across the country, health insurance storefronts are popping up, sandwiched between clothing shops, drug stores and home goods retailers. Though the storefronts have existed for some time, excitement and anxiety over the Patient Protection and Affordable Care Act (PPACA) have prompted an explosion in the retailization of health insurance, with many carriers offering in-store services that go beyond basic customer service — blood pressure checks and educational seminars, for instance. Many compare themselves to banks, or to hands-on retailers like Apple, offering Genius Bar-like kiosks with on-the-spot problem resolution. What they are offering is an experience that puts a face on the organization. Tom Paul, UnitedHealthcare’s chief consumer officer, says that while the stores have been many years in the making and are not a direct result of changes in health care, business has picked up since PPACA became law. Minnesota-based UnitedHealthcare — the country’s biggest health carrier — is opening outlets across the United States. One of its most recently opened stores, in Queens, N.Y., offers help in the eight languages and Chinese dialects spoken in the neighborhood. Another, inside a retirement community in Florida’s Sumter County, concentrates on its elderly residents. “We’re looking to address a broad spectrum of consumer needs in specific cultural or socioeconomic settings — some of the centers may have social workers on staff, for instance,” Paul says. A shift in the market from group plans to individual plans has also created new needs for clients, says Pete Mittleholzer, the market leader for a six-month-old store in Austin for Bernard Health. A key difference between in-store advice and dealing with a broker is the fee structure, he says. While the service in these stores is typically free, it is sure to bolster carriers. As many as 85 million consumers will be shopping for their own health care on government and private exchanges this year, according to consulting firm Oliver Wyman. Carriers are trying to promote their brands and reputations for customer service. What better way to advertise than to hoist a banner across the front of your inviting new marketplace? “You’re going to have to market in a more retail environment, something that this industry hasn’t had to do historically. Branding is going to become even more relevant,” WellPoint Chief Financial Officer Wayne DeVeydt said at an investor conference in 2012, after the company announced a $50 million branding campaign. But the new strategy is frowned upon by some. In a shopping mall on the western outskirts of Harrisburg, Penn., set between a pet supply store and a dental clinic, is a Highmark Direct shop, open since 2009. Eric Beittel, a health insurance agent at nearby Enders Insurance Associates, has visited a few times. “I have gone to see what they have to offer, of course,” Beittel says. “There is hardly anyone ever there. I think brokers and agents sell a lot more policies than these stores do. Consumer advocates also are unhappy, worrying that uninsured people will lean on the retail outlets rather than shop on their state’s health exchange. “They are only looking at one brand, rather than a wide range. Competition is good,” says Ron Pollack, director of nonprofit health care group Families USA. But for carriers, it is also a way to get to know the individual market, as the majority of their experience is in the employer-provided sphere, says David Ridley, director of the health sector management program at Duke University’s Fuqua business school. “They don’t know the individual market as well and are unsure whether this will be profitable, so they’re moving very carefully,” Ridley says. The trend is likely to continue, says Marc Pierce, president of Chicago research and strategy firm Stonegate Advisors, which has helped several carriers evaluate retailing. “The industry is finding ways to reinvent itself,” he says. But it is not just the health insurance industry looking to get in better touch with individuals. In Colorado, the state marketplace Connect for Health Colorado last month opened a temporary storefront on the 16th Street Mall, where consumers could purchase coverage and apply for tax credits during the last weeks left in open enrollment for health insurance. Certified brokers and health coverage guides were there to offer assistance. 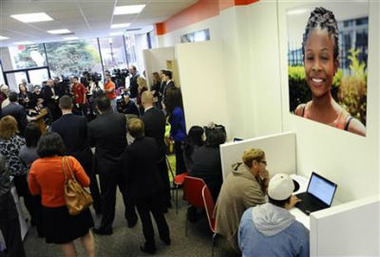 In Connecticut, Apple-inspired storefronts and “assisters” to outline plans in layman’s terms has worked. In the Department of Health and Human Services’ recently released scorecard showing how federal and state exchanges have performed in achieving their enrollment targets, Connecticut far outpaced every other state. In fact, Access Health CT reached its March enrollment target by December, and by mid-April had enrolled more than 208,000 individuals in health plans during the first open enrollment period — more than double the original goal of 100,000.